Few words ring as sweetly in the ear as “March Madness.” Without fail, this sporting event delivers anguished tears, provides electrifying competition, prompts tears of joy, creates heroes out of last-second desperation shots, and caps off the event by – once again – bringing tears to the moving strains of “One Shining Moment”. 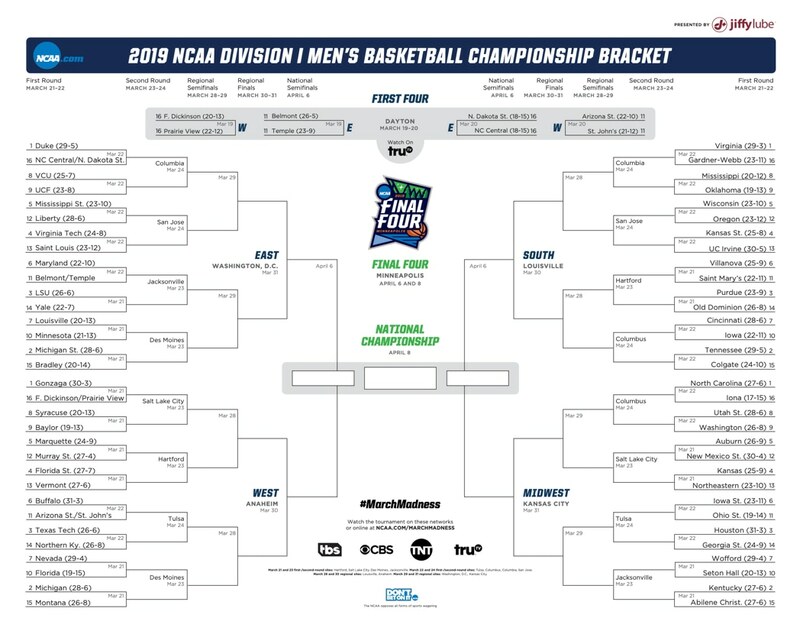 The good people at the NCAA have indeed created a beautiful sporting event, and they’ve also generously enough supplied us with an unlimited quantity of blank, free of charge brackets. Brackets just waiting to be filled in by you and your children. A caution, however: bracket work with your young crew is most likely going to lead to some variety of humility. Sure you may have a kid select Wofford to win it all, but you may also look at your ruined bracket and see that your child has wisely selected that glass-slippered Cinderella who decided for the first time in their history to take a trip to the Final Four. This is taking the virtues of the “Mascot Appeal” approach and going to a deeper level (read: get Google ready). With this extra Google-ing effort, you’ll be debating the merits of Thundar (yes, that is correct) the Bison, Sparky, Goldy, and Knightro. Our good collegiate institutions across the United States like to incorporate a variety of colors in their uniforms, so perhaps appealing to a more aesthetic side would serve your children well as they make their selections. Blue and Crimson vs. White and Red? A final strategy might be to breakdown match-ups by individual states. All sorts of intriguing match-ups are available between Mississippi and Oklahoma. Wisconsin and Oregon. Again, some Google-ing is likely needed here, because Iona/Colgate/Wofford. If sticking with any one of these selection criteria feels too mundane for all 63 games, then mix it up by round. Never a bad idea to run with Mascot Appeal when working your Sweet Sixteen match-ups. Finally, a prize to the winner of your bracket challenge is always fun. Doesn’t have to be much…perhaps the winning bracket is allowed their choice in the ice cream aisle (with the whole fam sharing in the spoils). Brackets completed and ready to catch some action? Not a bad moment to utilize the Whirly Pop or pull together some homemade pizzas.